Born in Yorkshire, Karen attended art college in Bradford then headed south to far sunnier countries, spending the next ten years travelling and working overseas. In a new country Karen finds she is more alert to each shape, shadow and surface. Back in the studio she simplifies and flattens space, recomposing, concealing and revealing, deliberately avoiding representational clarity to create vibrant compositions, never knowing how the piece will develop. Karen's signature work consists of vibrant, bold colours with strong architectural shapes and patterns. She takes her inspiration from her travels and the urban shoreline; weathered walls, decorative motifs and lettering. Increasingly, there is a strong abstract element, but there remains recognisable parts that draw the viewer in: the hook of a crane, the bow of a boat, the profile of a mast, all of which plays on the viewer’s imagination. 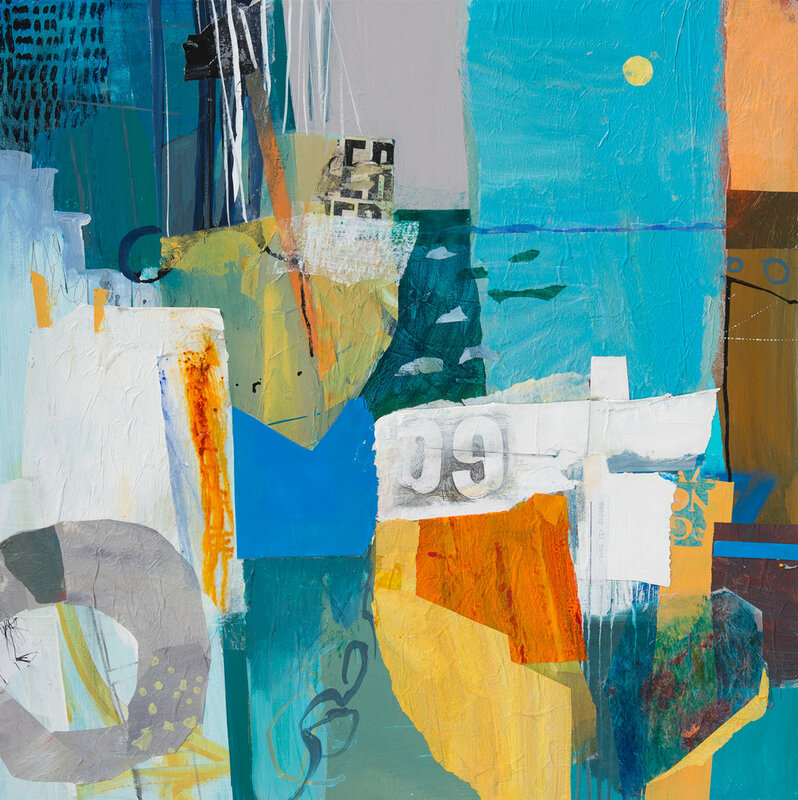 Karen says of her work "Collage is so versatile and immediate, I love the spontaneity of the ripped and cut line and the ‘history’ of a piece of abandoned paper. It is a controlled yet intuitive development that allows me a huge amount of freedom to interpret my sketches in a bold and original way. I draw, collage and paint. My work celebrates the worn surfaces and structures of the urban shoreline: boats, harbours, decorative motifs and lettering. I want to capture the memory of a place and the sense of human presence, echoing the passing of time, increasingly there is a strong abstract element but still with recognisable elements."